For the consumer, these competing solutions are mainly complementary to have access to more offers with a minimal equipment: people will simply not buy a media-player for each catalog. 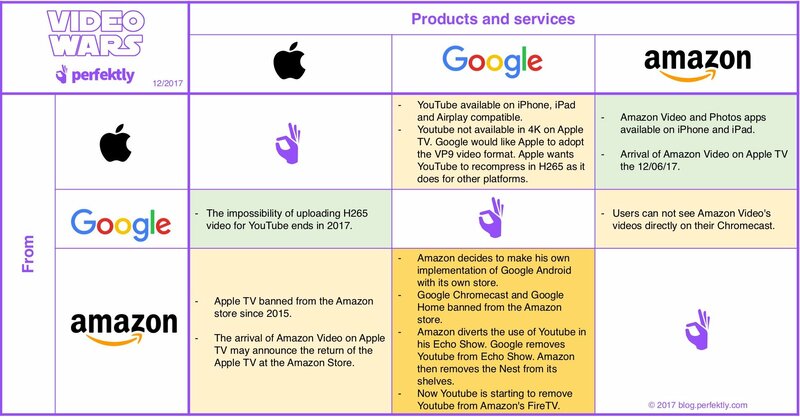 In order to make each offer more attractive, we have seen in the past many fruitful collaborations such as those of Google making Youtube available on the Apple TV on day one. But today, as the market gains maturity, the tensions reappear and each actor tries to use his strengths to his advantage to gain leadership. Amazon is blackmailing the availabilty of Apple and Google products in its e-commerce store to make its contents, brand and global store emerge even more. All of this changes permanently of course. But thanks to the Perfektly service, without worrying about technical incompatibilities and political options, you will be able to always know which service is really available on which equipment and in which quality. So, in 3 clicks, Perfeklty allow you to always make the right choice. Previous Previous post: The Amazon Fire TV Stick finally available in France: The 7 key points!